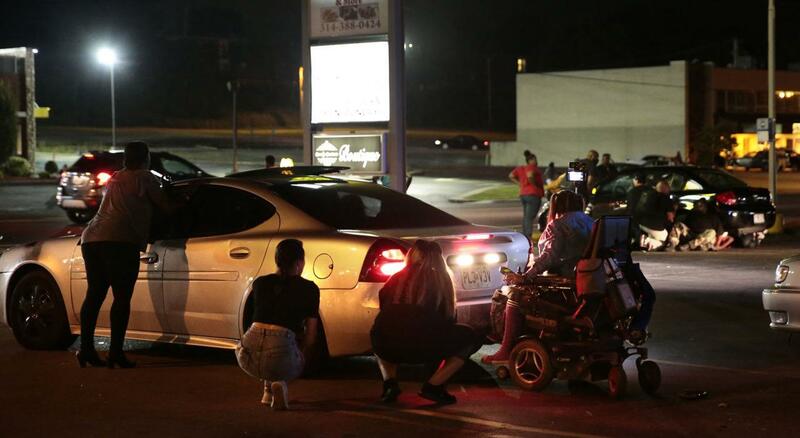 Gunfire broke out during a demonstration in Ferguson, Missouri, on the second anniversary of Michael Brown’s death, disrupting what had been a peaceful gathering Tuesday night but apparently wounding no one. 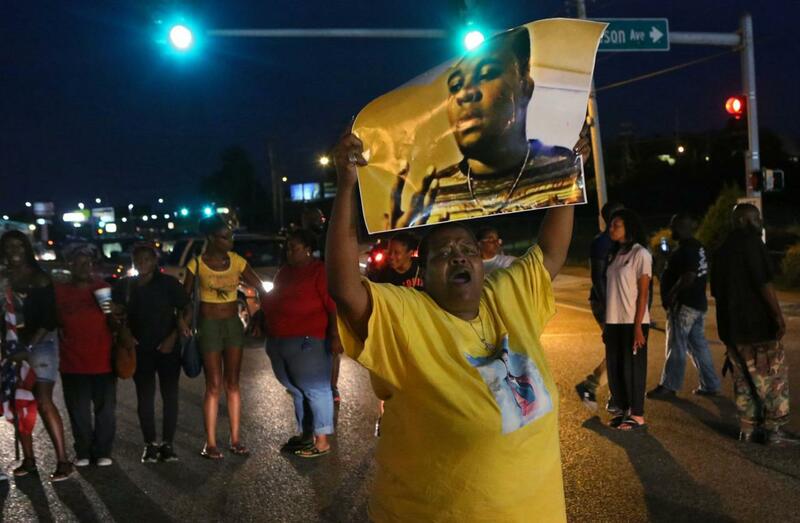 Witnesses told an Associated Press reporter that a car sped through a group of protesters who were blocking a street during the demonstration marking two years since the unarmed black 18-year-old’s fatal shooting by a white police officer. They said the car struck a young man so hard that he flew into the air. As the car drove away, shots were fired, they said. “A lady came down and hit a protester — knocked the shoes off his feet,” said Sharon Cowan, who was at the scene. “Hit him, and he rolled and he bounced.” The man appeared to be badly injured and was put into a private car to be taken to a hospital, she said. Heather De Mian, who frequently livestreams protests in the St. Louis area, said she screamed when the man was hit. “Then when the bullets flew, I started screaming some more,” she said. Police responded to reports of gunfire but had found no evidence that anyone had been struck, said Ferguson spokesman Jeff Small, who declined to speculate about why the shots were fired. By around 10 p.m., the protesters had disbanded. 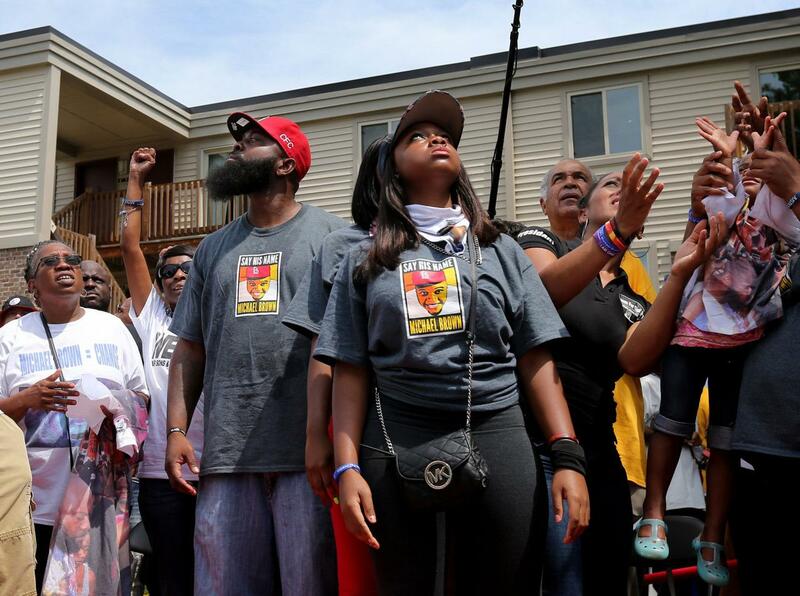 Earlier in the day, a few hundred people gathered for a memorial service and moment of silence along Canfield Drive at the spot where Brown was fatally shot by officer Darren Wilson after a confrontation on Aug. 9, 2014. A state grand jury declined to press charges against Wilson, and the U.S. Justice Department later cleared him, concluding that he had acted in self-defense. He resigned in November 2014. Brown’s death led to months of sometimes-violent protests in Ferguson. It was also was a catalyst for the Black Lives Matter movement, which rebukes police treatment of minorities and has grown following several other killings of black men and boys by police, such as Tamir Rice in Cleveland and Philando Castile in Minnesota. Brown’s father, also named Michael Brown, said in a brief speech during the memorial service that the anniversary was a sad day for him and his family, and for the world, too. “My son built families up, opened the eyes of the world and let them know this ain’t right,” he said. “This color is not a disease. This color is beautiful. Black is beautiful.” The 2014 shooting also led to a Justice Department investigation that found patterns of racial bias in Ferguson’s police and municipal court system. The federal agency and the city agreed this year to make sweeping changes. This month, more than 60 organizations affiliated with the Black Lives Matter movement released a list of six demands and 40 recommendations for how to achieve policing and criminal justice reforms. Brandy Shields, 19, went to school with Brown and remembered him as a kid who “never got into trouble.” Shields comforted a little girl who was crying at the service. “It’ll get better,” Shields told the child. “We have to make it better, but it’ll get better.” See more news-related photo galleries and follow us on Yahoo News Photo Tumblr.